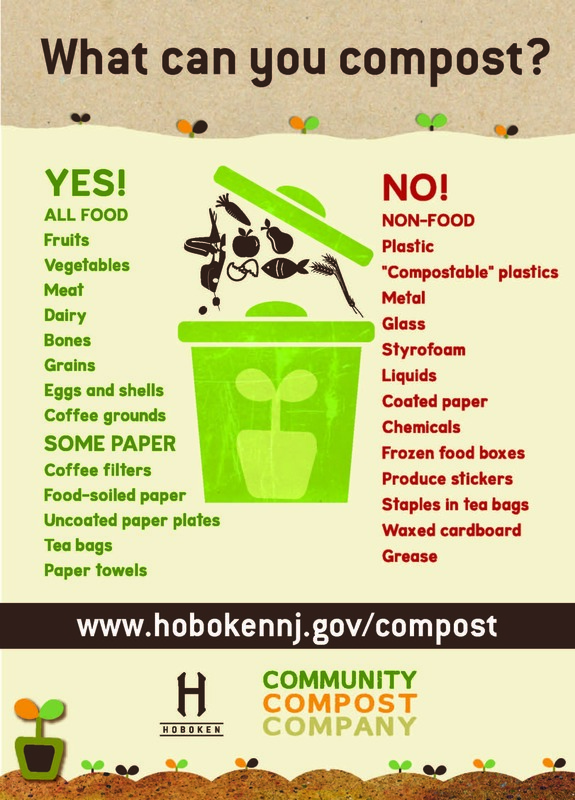 In partnership with Community Compost Company, the City of Hoboken offers the following composting services. Community Compost Company takes collected food scraps to farms where they are recycled into compost, which is used to fertilize the soil. Garbage from Hoboken is transported to a landfill in West Virginia and tipping fees alone cost $100 per ton of waste. Separating food scraps and other organic materials for composting is an easy way to divert waste from the landfill and reduce greenhouse gas emissions. It also saves money for Hoboken taxpayers by cutting down on landfill fees and the volume and frequency of garbage collection. We welcome the opportunity to visit your business and discuss your waste disposal operations. For any questions or to schedule a visit, please contact Dave Calamoneri at dcalamoneri@hobokennj.gov or 201.420.2000 x4000. Business and School Compost Pickup Program— FREE! The City of Hoboken and Community Compost Company offers FREE curbside pickup of food scraps services to local businesses and schools. Please take this short (10 minute) survey if your business would like to learn more about FREE compost pickup (see "What Can You Compost?" below). 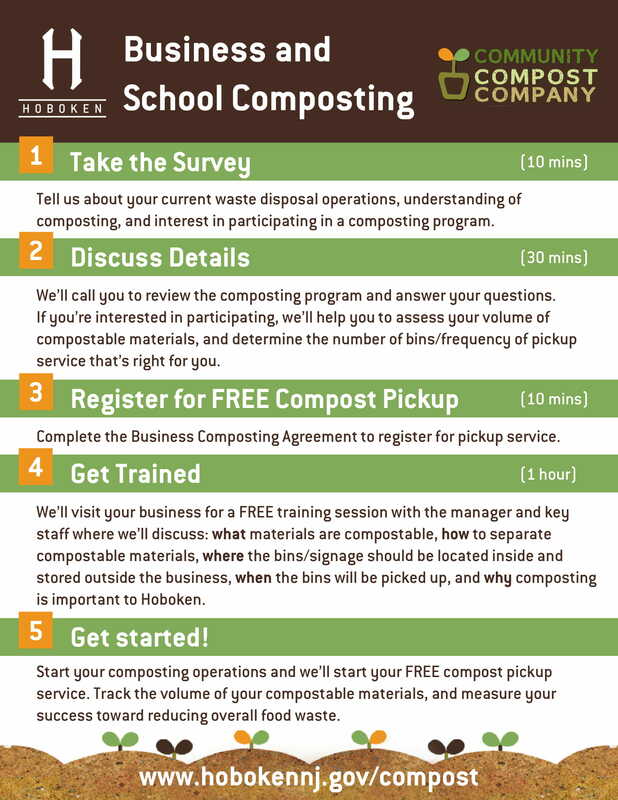 Business and School Composting Pickup Survey. Business and School Composting Program Agreement. Download the Business and School Composting Flyer. Residential Compost Drop off Program — FREE! The City of Hoboken and Community Compost Company are offering a FREE compost drop off site for Hoboken residents. Residents are invited to drop off food scraps and other compostable materials (see “What can you compost?” below) at the Public Works Garage, 256 Observer Highway (corner of Observer Highway and Willow Avenue) on Saturdays from 9 am-12 noon and Mondays from 8 am-12 noon. In 2015, the City of Hoboken partnered with the Community Compost Company to implement one of New Jersey’s first residential composting programs. 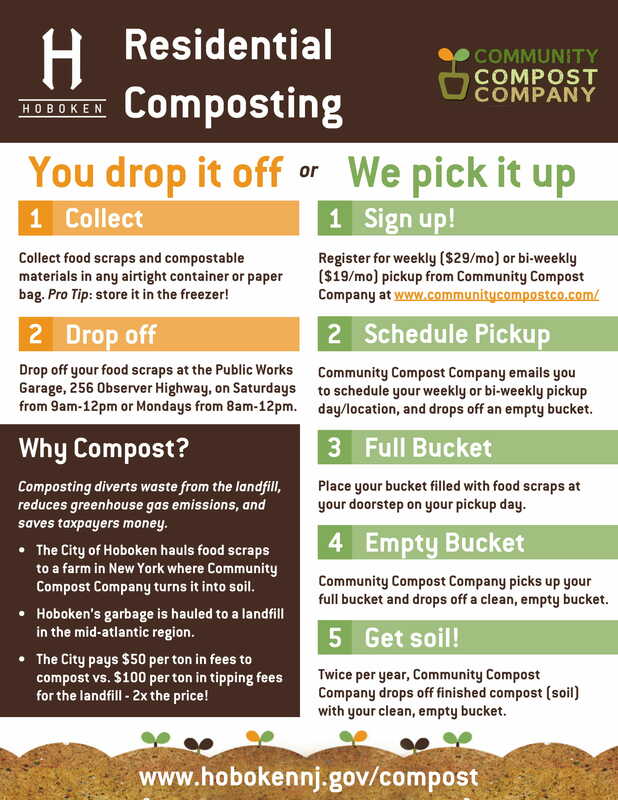 Community Compost Company picks up your food scraps (see “What can you compost?” below) directly from your doorstep for a nominal fee of $19/month for biweekly pick-up service or $29/month for weekly pick-up service. Click here to register for residential compost pickup service.